I hope you spent a fabulous weekend. I am back again with another tutorial on how to make an Ituan Basi inspired beaded fabric necklace. If you love fashion then you have to learn to make some things on your own because you can't buy everything plus its fun to try . I took a bunch of pictures to show you how to do it but realized that I learned this from another blog so to give them credits I am going to link their tutorial Here. Below are a few pics on how you can actually wear this item. I was trying to create story but failed miserably. So it was supposed about 4 girls that met and realized that they are all wearing the same item but in different ways. Number is surprised , Number 2 is working it ( like yeah I look good) Number 3 is just happy to be there and number 4 is the mean girl . 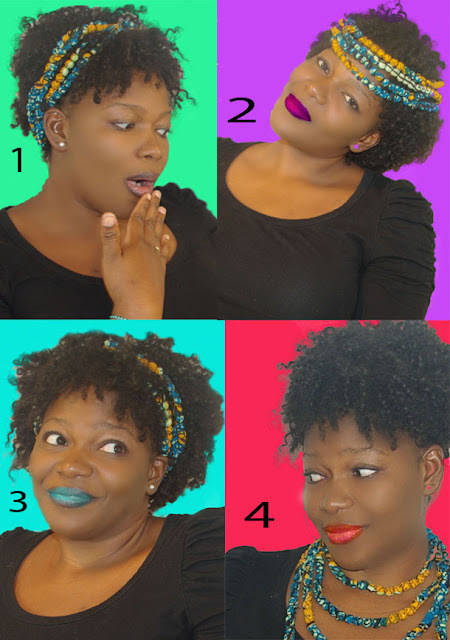 Anyways I hope you all get to try this and send me pics on how you rocked you beaded fabric necklace.BTW which one is your favorite ? @Afrikan princess make sure you sent me a pic girl !!!!!!!! Waoh this is lovely. Esp using it as hair accessory. So cool!